Home » Three Stooges feature films » Stop! Look! and Laugh! Itâs a Three Stooges buffet that will satisfy every appetite! Get ready to sink your teeth into a feature-length compilation of clips from your favorite Three Stooges shorts, plus a hilarious short film from the 1940s in it entirety. Stop! Look! And Laugh! 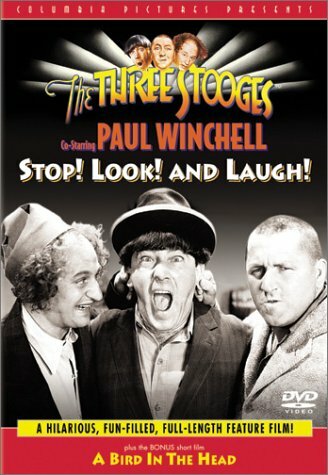 (1960) was compiled by producer/director Jules White, who has edited together some of the funniest Three Stooges clips featuring Moe Howard, Larry Fine and Curly Howard. Introduced by Paul Winchell and his dummy Jerry Mahoney, these classic clips include bits from such favorites as “A Plumbing We Will Go,” “Micro-Phonies” and “How High Is Up.” Also featured are the Marquis Chimps starring in a hilarious rendition of the Cinderella story. BONUS SHORT FILM: In A Bird in the Head (1946), a mad scientist in need of a human brain small enough to transplant into his pet gorilla becomes convinced that he has found the perfect donor in Curly. This time the Stooges really need to use their heads – before Curly loses his! Movie quotes from Stop! Look! and Laugh! Paul Winchell: You don’t know how the world began? Jerry Mahoney: Well it was a little before my time. Paul Winchell: [trying to teach Knucklehead some basic arithmetic] Put one finger up. What do you have? Paul Winchell: Now put another finger up. What do you have?